Parakeets make exceptional pets. They are inquisitive, playful, and love to chirp along with their daily home environment. When purchasing a brand new parakeet you may be left wondering what to name your little friend. This list aims to help narrow down the decision by presenting the top five parakeet names whom we have selected from a researched list of over 30 names. 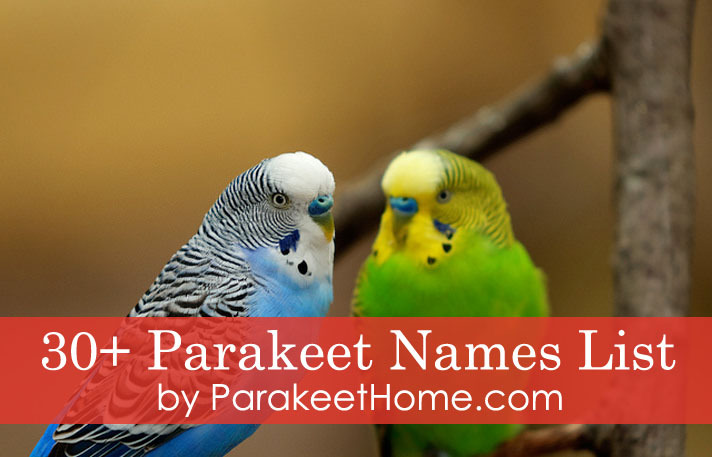 Choosing a name that is well suited for your parakeet is good not only for your new pet but for you as well. The name you choose will stay with your new bird its whole life, so take a breath, look over your options, and before you know it your little-feathered friend will have a name! 1. Tweety - Is your parakeet smarter than all the household cats? Made popular thanks to the famous "Looney Tunes" bird, Tweety is our favorite name on the list. Full of color and animation Tweety is especially a great name for parakeets that are yellow. If you do name your newly purchased parakeet, Tweety just makes sure not to name any of your cats Sylvester or there may be trouble! 2. Sunny - Sunny is a bright, warm, and charming name for a parakeet that will bring you joy every time you call their name. Go on and try, we guarantee you'll smile. Parakeets give off an extremely happy and warm aura that sets them apart from other birds. Sunny is the perfect name for a parakeet that is a little ray of sunshine lighting up your life! 3. Tiny - Whether it is an ironic name for a large parakeet, or you simply own a small bird, Tiny is a wonderful choice. Tiny is a superb name for a little pip-squeak parakeet that harbors a great deal of personality and spirit. Little parakeets typically are wonderful little chirpers that love to spend time flying about a room. If your little guy is small and energetic, tiny might just be a name made for them. 4. Angel - Is your parakeet a little sweetheart? If so, an angel might be the perfect name for your little buddy. Angel accurately describes a sweet parakeet that never gets into trouble or bites. Is your parakeet a softy in its heart? Does it have the soul of a lovebird that is incapable of causing trouble? If so Angel might be the perfect name for your brand-new partner. 5. Buddy - Last but not least on our list, Buddy is a name for faithful parakeets that are always perched right on your shoulder. If your parakeet is your best friend and can't get enough of spending time flitting about around you as you relax at his side, then Buddy is the perfect name for your new pet. A parakeet can be a great friend, but perhaps it could be an even better "Buddy"! Since naming a parakeet is serious business, (albeit extremely fun!) we couldn't only leave you with just our top five parakeet bird names. While these names didn't make the top of our list, we think each name would be perfect for a new unnamed parakeet. Remember to try and think about how your parakeet acts and behave and then read the name aloud. Does the parakeet respond? Does the name seem like it fits? Below is a list of thirty more names to think over. We know you'll make a great decision! Now that you've seen all the names, which do you prefer? Does your parakeet remind you of a Sunny or a Buddy? We're certain you'll choose the best possible names for parakeets. Picking a name for a pet is fun. After you spend more time with your new pet, you will learn the traits and features that define who they are. Observing how they act and behave is a great way to influence your name choice. Parakeets make faithful companions who love to sing and chirp all day long, so don't sweat it; they'll love whatever you choose!